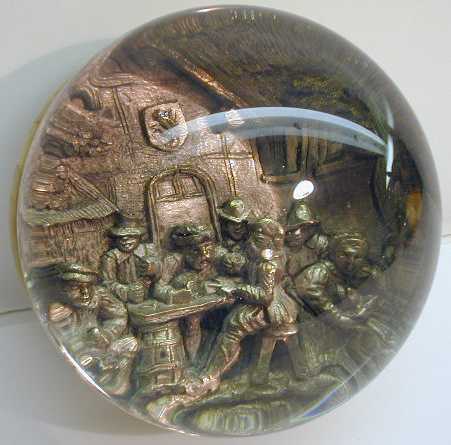 Antique Pinchbeck weight on alabaster base depicting a tavern scene and a group of revellers. Diameter 3 1/8". Antique Pinchbeck weight. Tavern scene with a group of revellers. Diameter 2 1/4". Antique Val St. Lambert (Belgium). Large sulphide (? of Joan of Arc) rests on a pale pink sodden snow ground surrounded by a circle of pink/green/white cross canes and a torsade of lime green/rose/white/yellow. Single top facet. Unsigned. Diameter 3 3/8". Antique Val St. Lambert (Belgium). Antique sulphide of woman and poodle dog. Antique miniature, multi-faceted, multiple star canes, all canes are stars. Possibly attributed to Val St. Lambert, Belgium, as cut down doorknob. Antique Bohemian spaced concentric millefiori with single large central cane on yellow ground. Antique Bohemian, bottom-engraved ruby flash depicting a stork and water scene. No faceting. Antique Bohemian picture weight. Oval-shaped clear weight with photo on sulphide over a ground of fine frit, vertical star faceting running from the top of weight partially down the sides, placed internal bubbles. Photo is of Tomas Garrigue Masaryk, founder and first President of independent Czechoslovakia. Antique Bohemian picture weight. 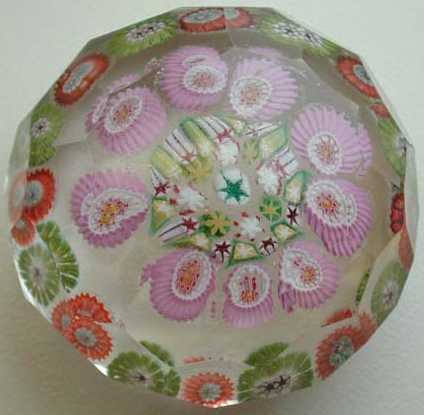 Oval-shaped clear weight with photo on sulphide over a ground of multi-coloured frit, yellow combed feathering around bottom edge of weight, multi-faceted with front window facet, placed internal bubbles. Photo is of an unknown soldier. Unknown maker. Flat, octagonal weight containing sulphide of unknown man shown in profile. Circa 1900 (?). Bohemia/Silesia (c. 1900-1930). Clear, grey glass, with one large and four small placed trumpet flowers of black, brown, orange, red and lime green set on a base of spatter glass of black, orange, red, yellow, green and white, 10 pulled feather motifs, 21 facets, 6" h x 2 9/16" w.
Bohemia/Czechoslovakia (c. 1900-1930). Four lime green/blue/pink/white trumpet flowers surrounding a central trumpet flower rising from a pot of orange multi-coloured frit. Bohemia/Czechoslovakia (c. 1900-1930). Four trumpet flowers placed around one central trumpet flower of blue/orange/pink/white. Set into a hill of pale green. Concave vertical faceting. Bohemia/Czechoslovakia (c. 1900-1930). Four deep blue/red/green/white trumpet flowers surrounding a central trumpet flower rising from a pot of fine orange and multi-coloured bits. Bohemia/Czechoslovakia (c. 1900-1930). Four blue/red/green/white trumpet flowers surrounding a central trumpet flower rising from a pot of clear and coloured bits. Three trumpet flowers with a sprinkling of gold aventurine sit omn a bed of multi-coloured bits and silver aventurine. Base is flat and polished. Diameter 3 3/4", height 2 1/2". Bohemia/Czechoslovakia (c. 1900-1930). Four flowers composed of millefiori canes of green/white and red/white sitting on a multi-coloured hill. Combed threads of red around base. Broad egg-shape with slightly pointed top. Bohemia/Silesia (c. 1900-1930). A central orange, waved, three-layer rose surrounded by spaced millefiori canes above a multi-coloured frit ground. Multi-faceted. Overall pink and white flowers, multi-faceted. Diameter 3 5/8", height approx. 3 1/4". Three frit flowers, each one red, yellow or blue, with green frit 'leaves' rise from a pot of yellow/brown/black frit. Three top facets and three facets close to base. Diameter 3 3/8", height 2". Romanian plaque weight. "Costica Miri Negus"
A single purple five-petalled flower with a central bubble rising from an orange and white swirl. Small, multi-facetted. Maker unknown. An eight-petalled frit flower with placed bubbles at the ends of the petals with one central bubble floating above a flat base of the same multi-coloured frit. Maker unknown. A thick five-petalled dark pink flower with central bubble rising from a crimped pot of clear and pale-coloured bits. Maker unknown. Czechoslovakia, ca. 1970's. A paper-thin butterfly with wings finely dusted with white, orange, green and cobalt blue. Multi-faceted, 9 7/10 cm wide and 4 7/10 cm high. Maker unknown. Bohemian. Upright clear weight with painted cornflower and wildflowers, and bird with yellow breast (c. 1900). Bohemian. Upright clear three-sided weight with painted hummingbird and flowers (c. 1900). Bohemian. Upright clear three-sided weight with cut vase and painted flower bouquet (c. 1900). Bohemian. Clear upright cut pagoda type weight with amber base. Maker unknown. Bohemian. Clear upright commemorative weight, "14 Marec 1938" with three flags (-- , Slovak, German), flowers, and some faceting to the edges. March 14, 1938. German assurances to Czechoslovakia. With the incorporation of Austria into the Reich, the German government gave assurances to the Czechoslovak government of the German desire to improve relations between the two states. The French and Soviet governments categorically declared their intentions to honor their treaty obligations for the defense of Czechoslovakia. Bohemian. Motif "Margaret" in orange letters with three orange/yellow forget-me-knot type flowers placed above and five rods yellow/orange/white/blue/gold placed below. Fine white pot sits below. Encasing glass has a green tinge. Rough pontil mark. Unsigned. Diameter 3". Note similarities to previous weight. Bohemian. Butterfly composed of coloured frit edged in white (rods). Crazing due to construction gives the frit a sparkle effect. Butterfly motif floats over a bed of multi-coloured/clear pot. Encasing glass has a green tinge. Rough pontil mark. Unsigned. Diameter 3". Note similarities to previous "Margaret" weight. Commemorative weight, "1935" in orange letters floating above yellow wire-type five-pointed stars. Frit ground. Five bubble dark frit flower over white plaque. Sweden (Kosta Warff). Scratch signed on base "Jewel 1". Sweden (Kosta Warff). Scratch signed on base "Jewel 4". Sweden (Kosta Warff). Swirls of blue/green on clear. Scratch signed on base "Jewel 5". Diameter 2", height 2 3/8". Sweden (Kosta Warff). Swirls of blue/black on clear. Scratch signed on base "Jewel 5". Diameter 2", height 2 3/8". Sweden (Kosta Warff). Swirls of blue/green on clear. Scratch signed on base "Jewel 6". Diameter 1 5/8", height 3". Sweden (Orrefors). Abstract design of gold with bubbles. Faceted. Poland (Jablonski). Abstract teardrop shape of blue/green/pink. Original paper label. Bohemian, one central white five-petalled trumpet flower with 3 green-yellow trumpet flowers with cental bubbles, over multi-coloured frit bed, one top facet. Thuringia, early 20th century. Incrustation marble with sulphide cat. Belgium, Verreries du Centre. Two opposing soccer players with ball, upright weight with pedestal, pontil mark at back, ca. 1910-1930. Portugal. Fantasy flower with placed bubbles on a bed of multi-coloured frit. Boda, "Boda Library" shown on spine, clear molded weight in the shape of a book.